When Republicans say, “We need to support our President,” they don’t mean every President. They mean: Every Republican President. And only every Republican President. For Republicans, Presidents elected by Democrats are to be obstructed as often as possible–and impeached whenever possible. On October 1, 2013, Congressional Republicans shut down the government in an attempt to force President Barack Obama to de-fund his signature achievement: The Affordable Care Act (ACA). President Obama refused, and 800,000 federal workers were furloughed. On October 13, 2013, anti-Obama protesters gathered at the World War II memorial in Washington, D.C. They were angry because the memorial had been closed to the public. They weren’t angry at the Republicans who had shut down the government. They were angry at the President. In short: If the Republicans force the country into default, Obama should be impeached. And if the President finds a way to avoid default, he should be impeached. On October 16, the shutdown collapsed. The ACA continued to provide health insurance to millions of Americans too poor to afford to buy it. Liberals…catastrophe…shattering the American dream…leftists…communism…government terrorism…global warming myth…terrorism…socialism…secularism…environmentalism…takeover….corruption…betrayal…radicals…bankrupting…treason…subversion…slander…power grab. These are the themes repeated endlessly by the American Right and its publishing industry. Whether by accident or design, these works owe their popular success to the ultimate Right-winger of history: Adolf Hitler. 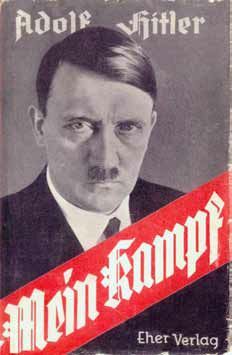 In Mein Kampf—“My Struggle”–his prophetic warning of the future to come, Hitler outlined his principles for the effective use of propaganda. “The broad masses of the people are not made up of diplomats or professors of public jurisprudence nor simply of persons who are able to form reasoned judgment in given cases, but a vacillating crowd of human children who are constantly wavering between one idea and another. “The great majority of a nation is…ruled by sentiment rather than by sober reasoning. “This sentiment, however, is not complex, but simple and consistent. It is not highly differentiated, but has only the negative and positive notions of love and hatred, right and wrong, truth and falsehood. “Propaganda must not investigate the truth objectively and…must present only that aspect of the truth which is favorable to its own side….The receptive powers of the masses are very restricted, and their understanding is feeble. On the other hand, they quickly forget. The Right has followed Hitler’s instructions to the letter. The election of Donald Trump is the end result of it.